Will YOUR under-floor insulation perform better than New Zealand Building Code better practice guidelines of R1.9? Anything less is considered only a minimum standard of under-floor insulation. Does YOUR underfloor insulation maintain its performance in Wellington's winds? Do YOU care about YOUR underfloor insulation quality as much as we do? Answer Yes, Yes, Yes, by choosing to insulate with our Palace Planks Premium range, the quality under-floor insulation solution for YOUR warmer, healthier, more energy efficient and more sustainable home. Made better, made locally and made for YOU by Poly Palace, YOUR local award winning underfloor insulation manufacturing and installation specialists. INSULATION: Palace Planks Premium 85mm R2.15 'thicker - warmer' insulation for YOUR wooden floor, or go 100mm thick with Palace Planks Premium Plus for ultimate R2.5 performance. 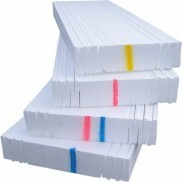 FRICTION FIT: Flexible concertina cuts and the widest range of colour coded sizes mean more insulation, better fit, and less waste. DRAFTS: prevents drafts through gaps in YOUR floor boards. Only polystyrene performs, don't go batty as Wellington winds rob fibreglass or polyester of YOUR insulation investment. NOISE: make YOUR floor quieter reducing echo. Solid thicker Palace Planks dampen noise not YOUR home. MOISTURE shield YOUR floor-boards from damp. Get superior resistance to moisture, damp and mould. VALUE : The highest performing underfloor panels with the lowest cost, that are better for YOU, YOUR health, the economy and the environment. Create a warmer drier and healthier home with Palace Planks. Thickness : 85mm R2.15 Palace Planks Premium or 100mm R2.5 Palace Planks Premium Plus. Width : The widest range of sizes from 235mm (9") to 560mm (22") in 25mm (1") steps or manufactured for any width requirement. Performance : Solid Durability , no sagging, shrinkage, rot or vermin. Tools: overalls, dust mask, head lamp, fine tooth saw, metric/imperial measure tape, waste bags. Installation: Position each Palace Plank so one side sits along joist, push up the other side while squeezing the concertina edge into the joist cavity. Once started between the joists, push the Palace Plank hard up against the floor and along so there is no gap with end timber or the other planks. Fit: Palace Planks must be fitted so the concertina edge is firm against the joist along the plank’s entire length. Palace Planks should be firm and not ‘float’ or move when touched. If cutting off a concertina makes a Palace Plank’s fit too loose, try the next size down and add a concertina. Area: Install all of the wooden floor area. Push Palace Planks along the joists into inaccessible areas. Quality: Measure & cut Palace Planks with a saw, never break by hand. Refurbish damaged Palace Planks prior to installation. Always cut Palace Planks square so that no gap between planks is apparent. Leave No Gaps: Install Palace Planks without any gaps. Plug gaps with off-cuts, expanding urethane foam or fibreglass Batts. Floorboards must not to be visible at the sides or ends of Palace Planks, or where notches have been cut. Waste: Fit off-cuts immediately into adjacent areas to minimise waste. Remove waste completely from the underfloor area. Working with waste littering the work area is an unsatisfactory work practice. Act Proactively: prevent accidental damage (eg. clip up wiring obstructing the work area immediately). Recycle: Return unused Palace Planks to Poly Palace, and return polystyrene waste for recycling. What under-floor insulation standards has NZ's Department of Building and Housing set? EECA Energywise installed foil in my house, should I replace it? Why do Palace Planks come in so many different widths? Will Palace Planks reduce noise transmission through MY floor? Manufactured with a 50/50 mix of recycled flame retardant building grade waste and virgin S - grade polystyrene for wide application in general construction as a sustainable substitute for S grade polystyrene. Tools: overalls, dust mask, fine tooth saw, metric/imperial measure tape, waste bags. Installation: Palace Sheet can be cut easily, quickly, and accurately with any fine tooth saws used for wood working. Wear a dust mask to prevent inhaling any dust. Marking Out: Palace Sheets can be marked with whiteboard or permanent markers. Also usefull are kitchen bamboo skewers for holding polystyrene sheets together or temporarily marking positions on Palace Sheets. Painting: If a painted surface is required use only water based and not solvent based paints. A better surface can be achieved by using a two way stretch net fabric (cost less than $1 per meter) and stretching the net over the Palace Sheet and holding in place with pins prior to painting. This forms a skin on the polystyrene that is significantly more resistant to impact damage and the painted surface is easier to wipe clean. This method can make subseqent marking and cutting easeir and provide a high quality edge. Waste: Remove waste and dust completely from the work area. Working with waste littering the work area is an unsatisfactory work practice. Recycle: Return unused and undamaged Palace Sheets to Poly Palace for a credit and return polystyrene waste for recycling. 100mm R2.5 Poly Palace Planks Premium Plus are the perfect solution to insulate under the floor o..
80mm R2.0 Poly Palace Planks Premium are the perfect solution to insulate under the fl..
Our unique manufacturing process enables us to produce this 100% recycled minimum cost alternativ..
50% recycled building grade flame retardant polystyrene Manufactured with a 50/50 mix of recycl.. Polystyrene and Polyurethane products must not be pushed up against Mains Power Cables. Poly Pala..
Poly Palace provide large plastic bags for FREE, for bagging polystyrene offcuts and waste, for r..